Home » Astronomy » What is exactly sustainable development ? 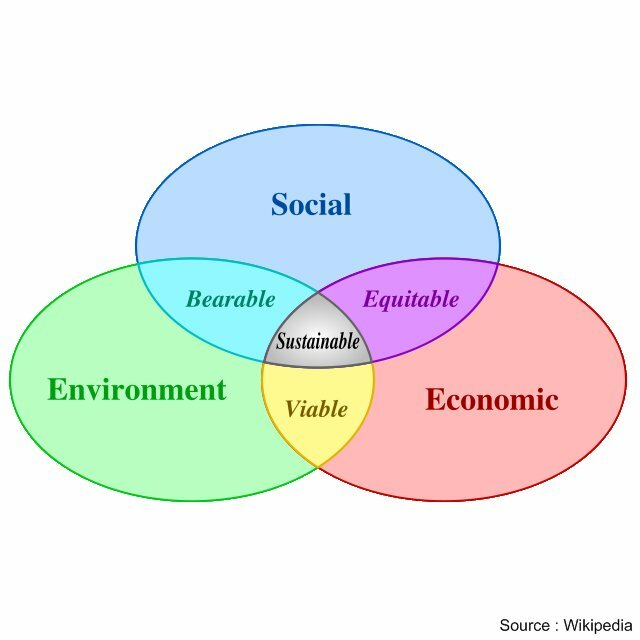 After more than 19 months of writing on a blog called Sustainable development and much more, I just realized I never explained what exactly is sustainable development. Basically this term is about three intertwined things (see left): the environment, the society and the economy. This is written with a decreasing order of importance . In this article, I will provide you with some data on this term that is more and more used nowadays, and also a bit abusively. This work encompassed some topics seen as vital for both Humankind as a species and for Nature : “Population and human resources, food security, species and ecosystems, energy, industrial development, and urbanization”. I suggest you read this page if you want a more profound understanding of sustainable development. If you want to read Our common future, you can buy it as it was published in a 400-pages book. You can also read it on your computer for free there. Most governments have only one word in their mind : the economy. To them the remaining parts are unimportant. In fact it is the exact opposite that is true. Indeed, without the environment, or in a highly degraded one, the society begins to crumble and might even fall. And with the society comes the economy. That was the case of several societies of the past. The book from Jared Diamond was about this very topic and I discovered while reading it that the Vikings, the Mayas and the Anasazi (among others) faced environmental issues and that failing to solve them lead them to collapse. As you can see, I believe after documenting myself for months that the economy is the culminating point of a successful society and a well protected environment. Gross Domestic Product (GDP) is thus a bad index for world leaders. So, are we heading toward a more sustainable development ? and even worse, most of our leaders don’t seem to be aware of the situation or are at best mild about their obligations ! All these facts are showing it all too clearly : 20 years later after the Brundtland report, some still don’t give a damn about sustainable development and future generations. Will this change ? Do we still have time ? After writing this article, I understand more why James Lovelock is thinking more about a sustainable retreat than a sustainable development. Which side will win ? The sustainable one or the business as usual one ? What do you think ?